Where are you buying fake carbide tips from JB? I've had some cheap tips from the UK but some decent ones at a bargain price from China. Put them under a scope and check the nose radius. Having only ever used the inserts supplied with the holders I have nothing else to make any comparison. The provenance of the OEM inserts could also be in question. As you say Jason we rarely use our machines at indistrial levels I'd guess its up to the individual to make a value judgement. There are some knock off Mitsubishi and Korloy inserts out there. The copies are very good in deed. The only difference was on the Ali inserts, they were not quite as shiny as the real deal ones. On the coated inserts, they did not last as long. For a home workshop, you will not notice the difference with the coated inserts. The Ali ones did seem to get a buildup on the cutting edge that the super shiny ones did not seem to be getting. The Mitsubishi people were out here in NZ last year investigating the knock off product and what it all looked like. 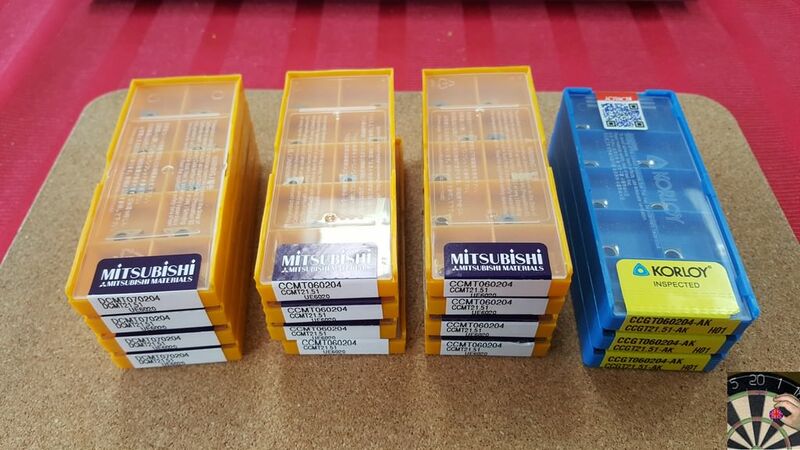 Mitsubishi, Korloy, Kyocera ,Kennametal and Sumitomo , are the main insert companies I get my inserts from. They all have good stuff and pick and choose what I think is the best that suites me. For example, the Sumitomo positive geometry PCD insert I trim my Ali pistons with, is by far the very best insert I have found for the piston trimming. After looking at the link above/below, they do look very much like the real deal, especially the Ali inserts. They look to have that mirror shiny polish on them. Bad Behavior has blocked 14731 access attempts in the last 7 days.